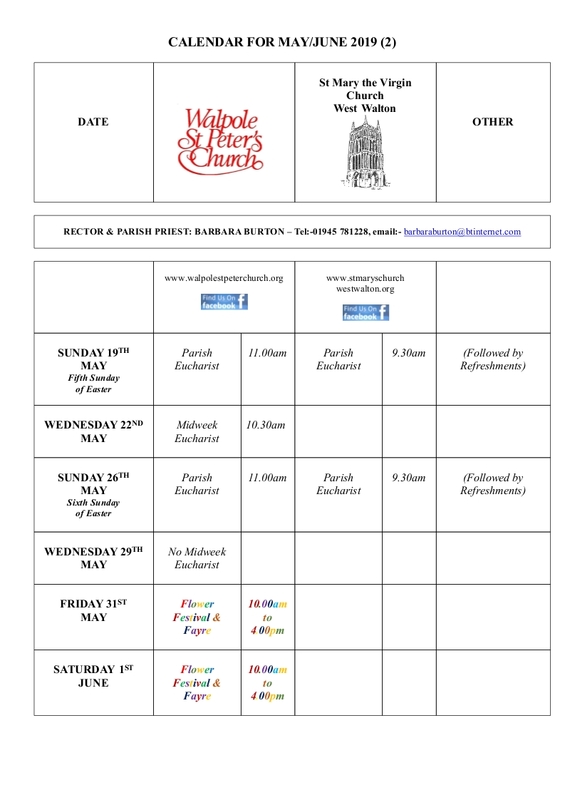 A very warm welcome is extended to all our regular worshippers and visitors. 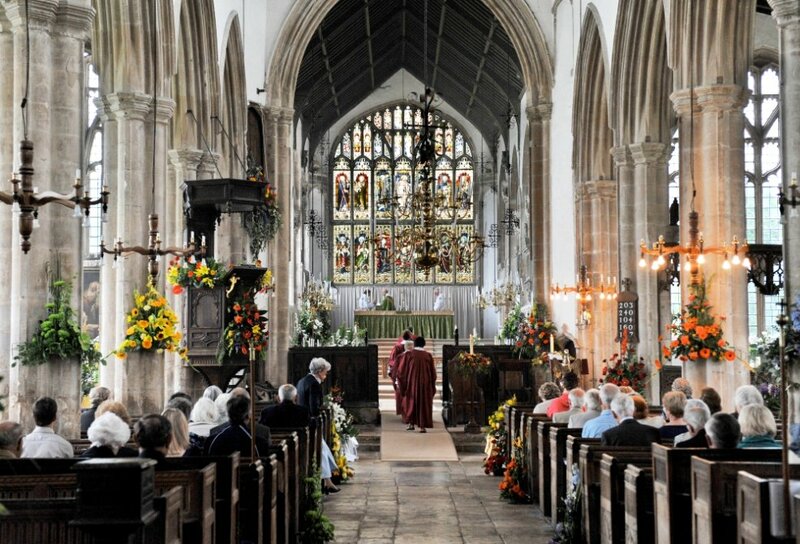 We hope you enjoy our beautiful church, which has been an integral part of the village of Walpole St. Peter for generations and which is steeped in history. For latest updates and other information join us on Facebook and follow our group. 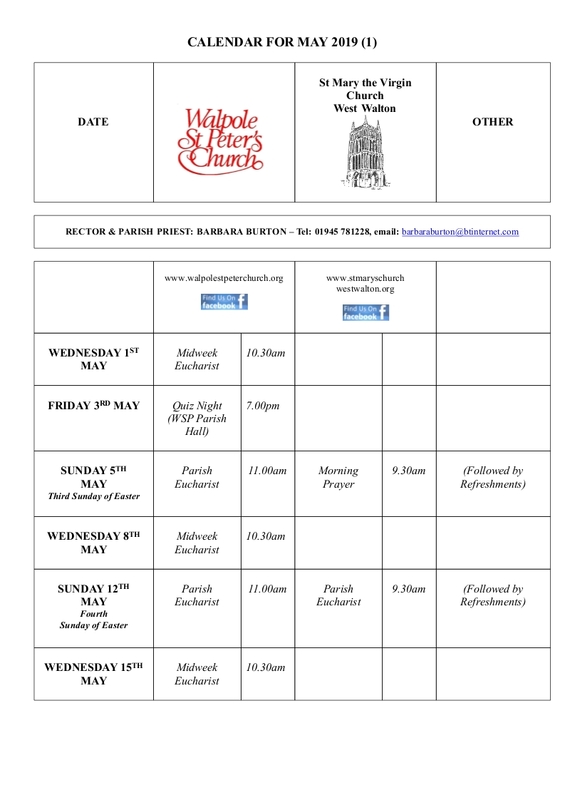 Please do join us for one of our regular services of worship. There may be some variations and additions to this. Please check on the Calendar Page for exact details of services for the specific month. 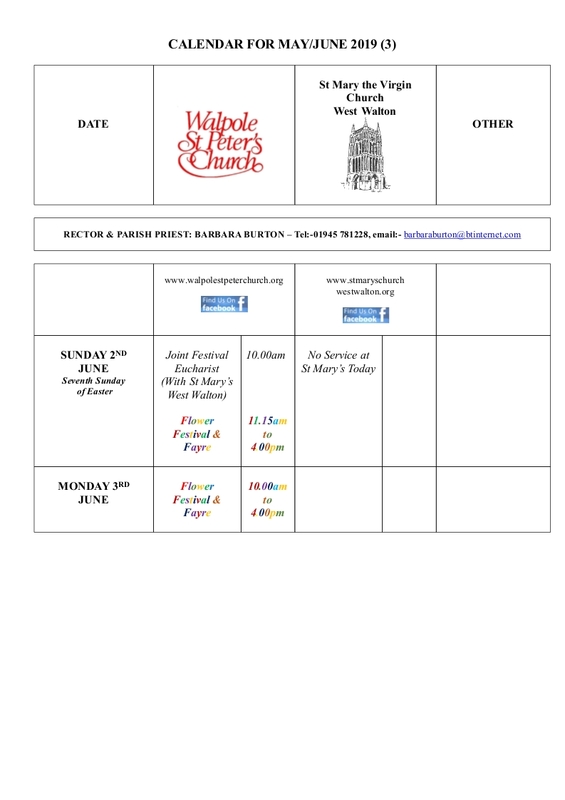 Evensong services are generally held once a year in each of the following churches Walpole St Peter's Church (September), St Mary's Church West Walton (August) and in the now closed but still consecrated nearby Walpole St Andrew's Church (June). 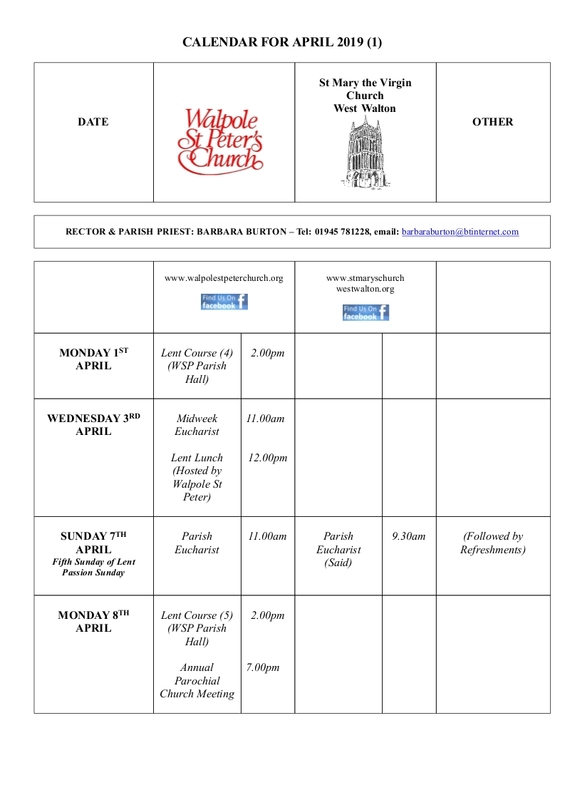 Please see the noticeboards for further details. If you are concerned that someone you know is at risk of, or is being, abused, or presents a risk to others, please seek advice from a Safeguarding Adviser or if necessary report the matter to Norfolk County Council’s Care Service (0344 800 8020) or the Police without delay. 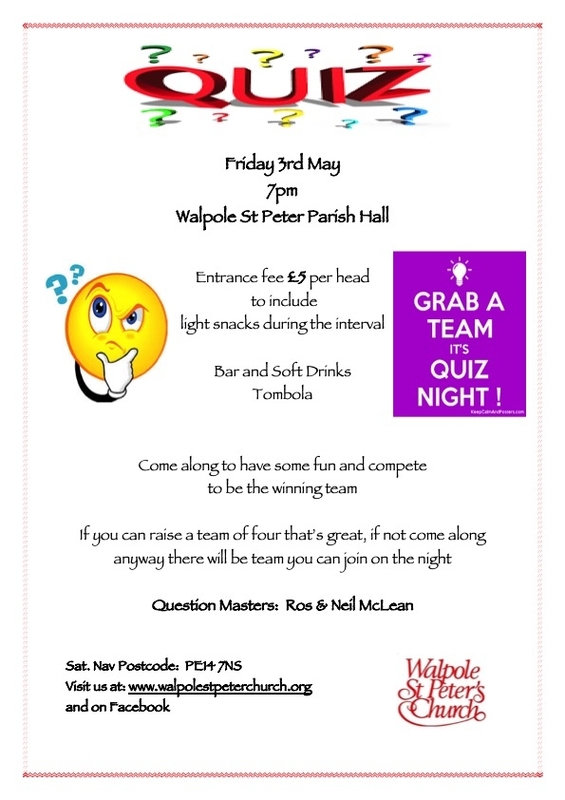 We will be hosting another quiz night in the Walpole St Peter Parish Hall and hope you will be able to join us for what has proved in the past to be a very successful and enjoyable event. Everybody is very welcome. Details are shown on the attached poster. 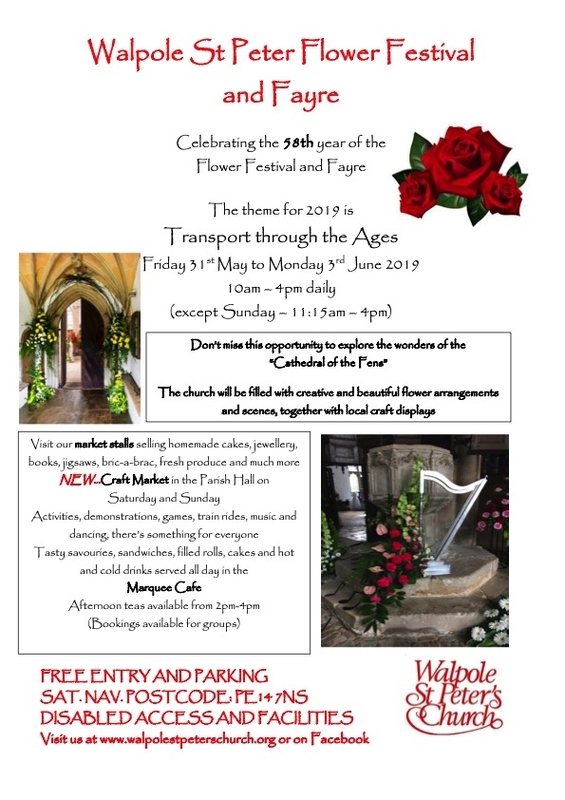 We are delighted to announce details of our Annual Flower Festival and Fayre in 2019. There have been some changes from previous years. This year the festival will run for four days only from Friday through to Monday. More details are shown on the attached posters and as our plans are finalised and developed we will let you know further. Please do put the dates in your diary. 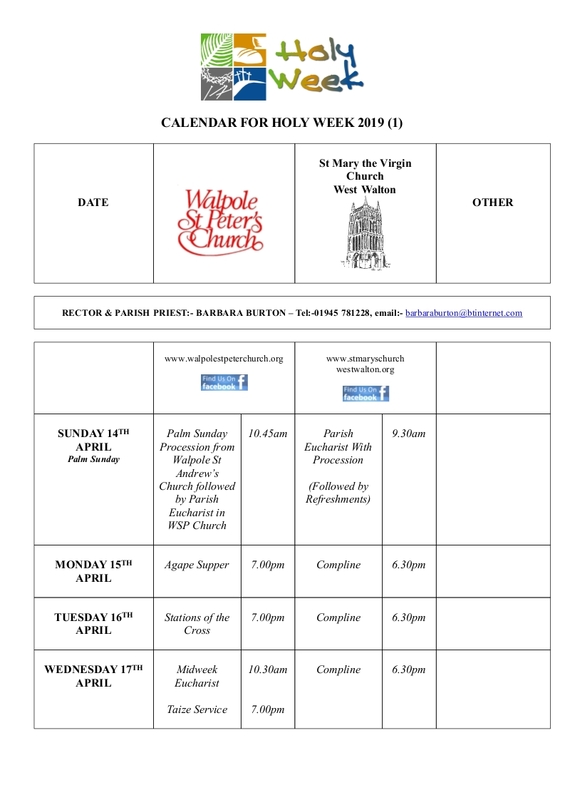 We very much look forward to welcoming everybody once again to this major event in the Walpole St Peter's Church Calendar. 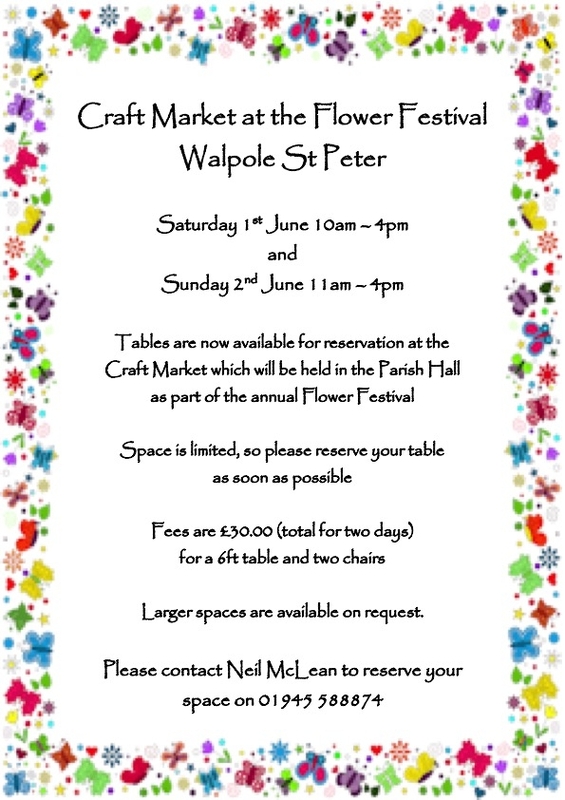 This year for the first time we will be holding a craft market in the Parish Hall on Saturday 1st and Sunday 2nd June. 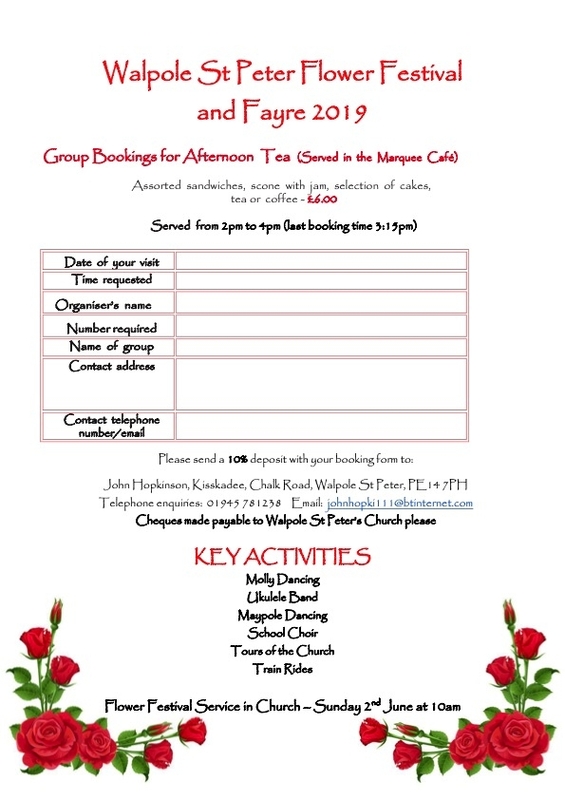 Reservations for stalls are now being taken and further details are shown on the attached poster. We are a gathering of diverse people from all backgrounds, seeking community and guidance through Christian worship and prayer. We aim to create a space where people can find themselves affirmed, included, challenged, and confident to ask difficult questions. We are committed to helping the poor, powerless and underprivileged in our own community and beyond. We aim to support children, parents and all vulnerable members of the community. We find the love of Christ to be an inspiration to us, and feel called to share this with as many as possible. Our worship style is traditional Anglican. For Eucharist services the priest wears an Alb and Chasuble. 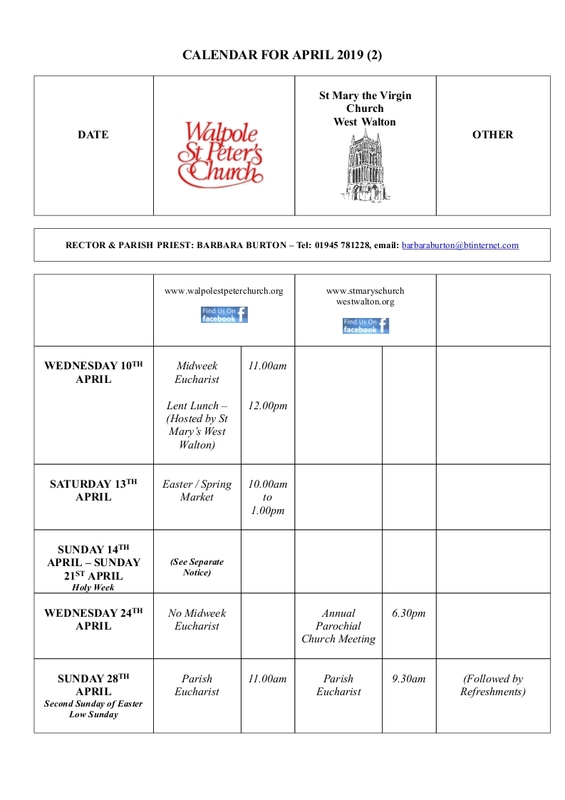 Evensong services are held once a year in each of the following churches Walpole St Peter's Church (September), St Mary's Church West Walton (August) and in the now closed but still consecrated nearby Walpole St Andrew's Church (June). The tradition of the church is to have a musical setting for the Sunday Eucharist. 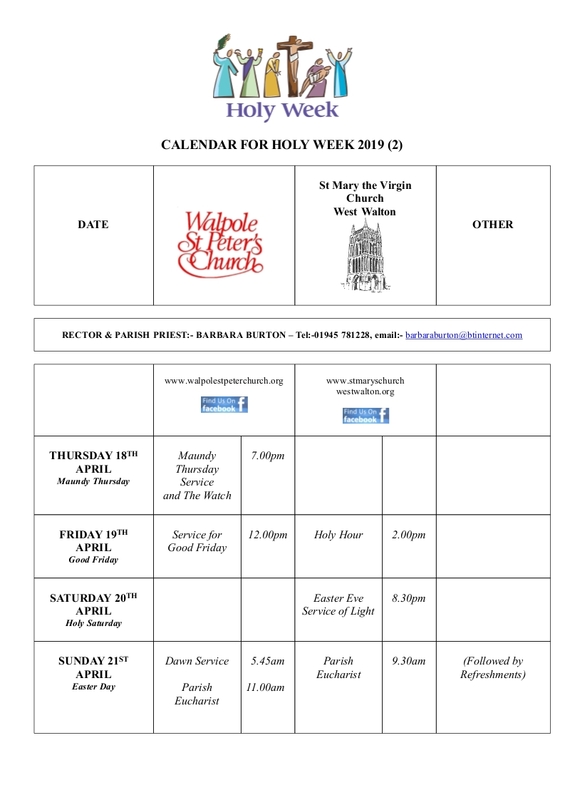 The midweek Eucharist services are held throughout the year at 10.30am (In Lent these are followed by a simple Lent Lunch hosted by individual members of the congregation from both Walpole St Peter's Church and St Mary's West Walton - Information on these is available on the Notice Boards. There is a traditional Carol Service, a celebration of the Midnight Mass on Christmas Eve and a Eucharist Service on Christmas Day. Other special and High Day services take place as appropriate. Baptisms can be arranged as part of the Sunday Eucharist service and are in place of the sermon or may take place outside the main service.